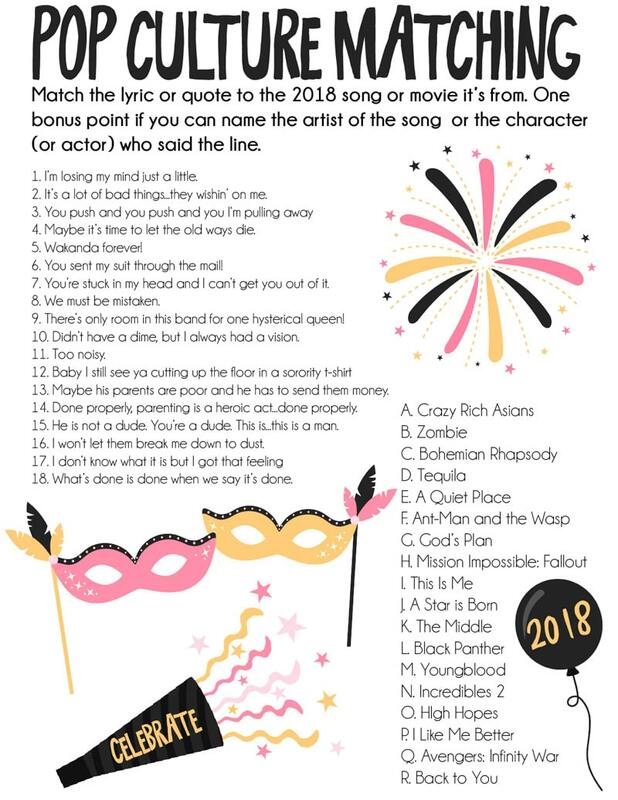 These printable New Year’s Eve games are perfect for any New Year’s Eve party! 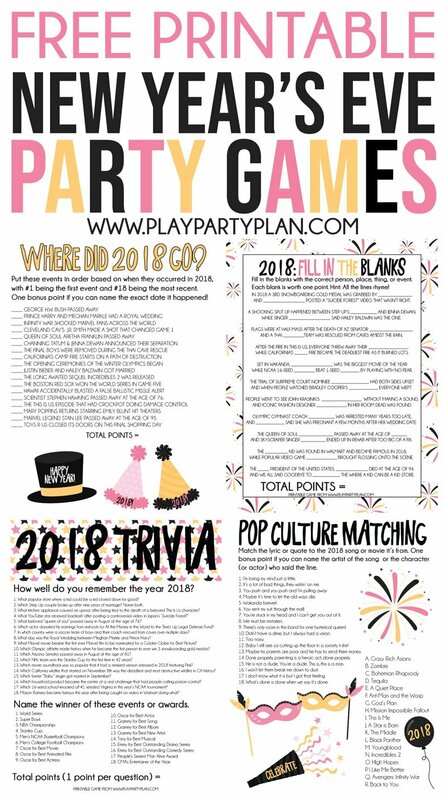 Simply print out one of the four New Year’s Eve trivia games and see how much your guests can remember about the year’s biggest news, pop culture, and sporting events! These are definitely our favorite best New Year’s Eve party games to play each year! 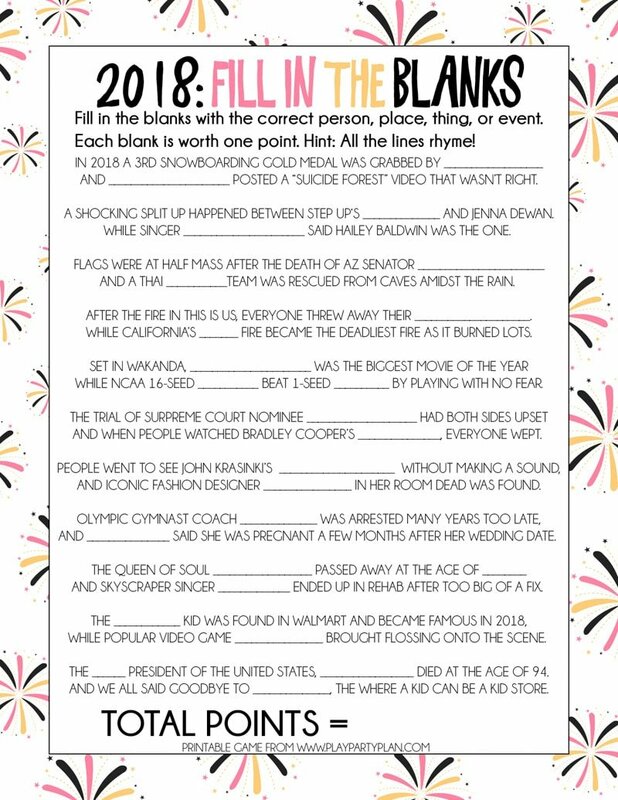 One of my favorite traditions each year is creating printable New Year’s Eve games based on pop culture, sports, and news events from the year. 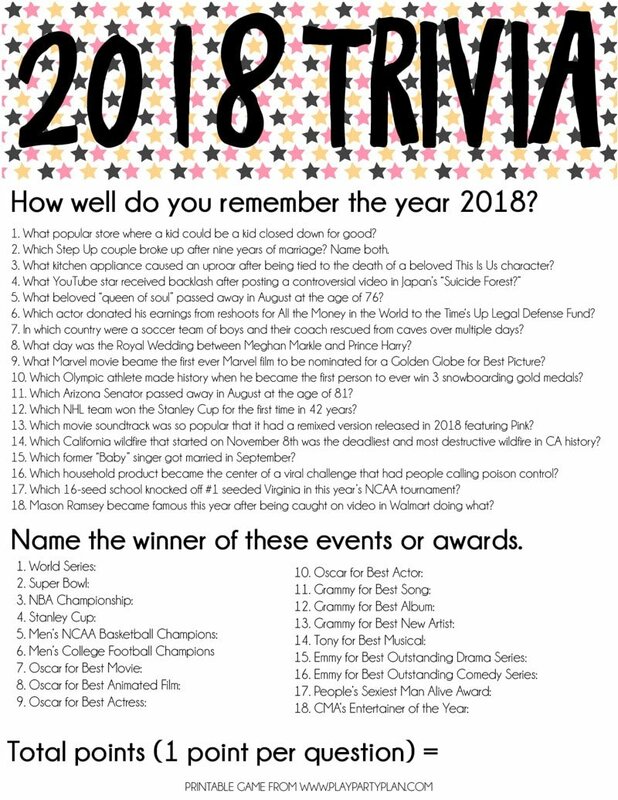 I’ve been creating New Year’s Eve trivia games for the last like eight years, and they’re always a big hit at New Year’s Eve parties! While you could play these possibly with teens or young adults, the questions will likely be tricky for kids! 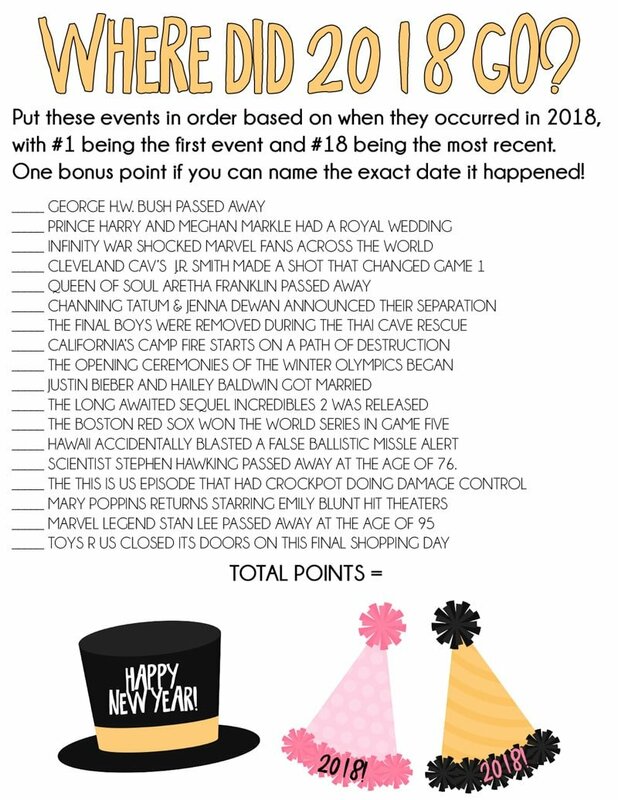 If you’re playing with kids, these New Year’s Eve minute to win it games or really any of the New Year’s Eve party games on this list would work! All four of these games use trivia from the past year including sporting events, news events, and pop culture events. As you’re reading through the games, you’ll probably notice that there are some major topics from the year missing – Trump, mass shootings, bombings, sexual harassment all over the place, and other things I just didn’t think needed to be of a party conversation. I know they were major parts of the year, but they are also sad and possibly controversial, so I just decided to not go there. Just know that I remember them and was just as affected as anyone else, it was a conscious decision to leave them off the games. The other thing you may notice is that a lot of the trivia questions or facts are used on multiple games. Most people don’t play all four of these games are their parties (you definitely could), they normally play one or two at most. Since a lot of the trivia things used on the games are major events, they will span across multiple games. So the second game may be easier for anyone who played the first. This is one of my favorite New Year’s Eve games because it gives me the chance to go back and look through the most popular music and movies from the year. The game is easy – read the lyric from a song or quote from the movie on the line and match it to whatever piece of artwork it came from. The songs and movies are all mixed together to make it a bit more challenging. This is one is just what it sounds like – trivia from the year. No matching, no fill in the blanks, and no shortcuts – you either know the answer or you don’t. This is probably the toughest of all of these New Year’s Eve party games because you actually have to know the answer, no hints or clues. This is also a fun one to play just to remind people of all the good things that happened this year! New Year’s Eve Game #3 – Where’d the Year Go? Okay so maybe I lied, this New Year’s Eve game might be the most challenging of the four. In this game, I’ve put together a list of 18 events that happened during the year. Players must put the number of the events in order from the first to happen during the year to the most recent. Some of them are easy like the Royal Wedding and others will have you scratching your head. Like trying to remember when you drove across the country trying to remember who dumped who. One day I’m going to come up with a better name for this game but for now it’s just fill in the blanks. And this my friends is my very favorite out of all of the New Year’s Eve games I make each year for one reason – I get to rhyme. I have a thing for rhyming and putting together this fill in the blank couplet game is one of the most fun things I do every year. Weird, I know, but I love it. The game is simple. I’ve put together a bunch of rhyming lines that spell out events that happened this year. Those lines have blanks that players have to fill in. When lines are filled in correctly, they’ll rhyme. This year’s game has everything from Infinity War to the yodeling kid! ALL four of the games AND the answers are in one PDF document for your convenience. There are two versions of each game – a full sheet version and a half-sheet version (to save paper), plus the answer sheet for a total of 12 pages. You should also receive an email with a link at the very bottom of the email to the file in case you forget to download it now. Once you’re done downloading the file, use your browser back button to come back to this page. And don’t forget to check out this fun gift exchange game that would be a perfect addition to your New Year’s Eve party! Love these games. Thank you for sharing!! Love these games! Can’t wait to play them! This sounds like so much fun! Planning to share with come coworkers at our first annual meeting.